We buy as much of our produce as possible locally and organically. From Blue Heron Farm in Lodi, we buy everything from watercress, grown on their pond, to spinach, leeks, and heirloom tomatoes in the summer, to beautiful winter squashes, arugula and root vegetables in the fall. Remembrance Farm in Trumansburg is where the majority of our salad greens come from. When late fall comes along, we use nothing but their Flower Power blend for our salads and salad accompaniments. Flower Power is a blend of organic baby greens, herbs and edible flowers that rivals any salad blend in our earth's history. 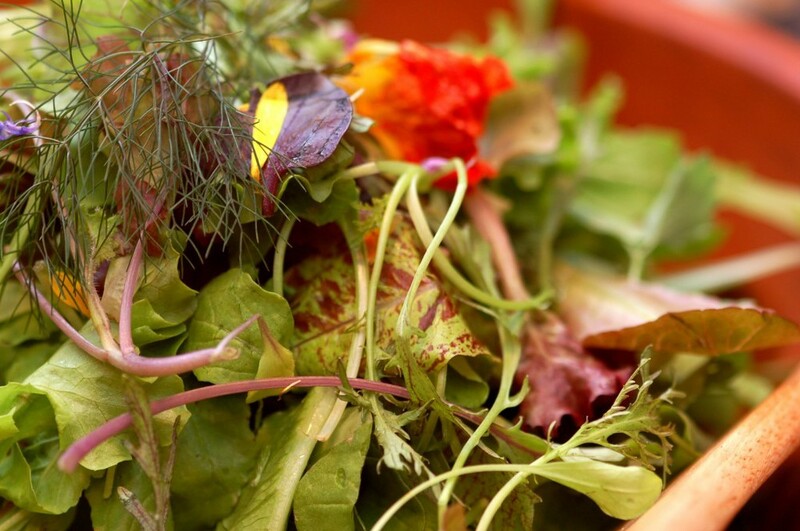 Before Flower Power is in season, we buy combinations of spicy greens and lettuces from Blue Heron, Remembrance Farm and Goodlife Farm and then blend them ourselves. Goodlife Farm is a horse farm in Interlaken that specializes in asparagus, ginger, and lemongrass, but also grow many other fun things that we buy to supplement our Blue Heron main stays. We have a garden of our own as well. This garden was started by our good friend Lisa Lang. There is both a perennial flower garden known as "The Labyrinth," as well as a produce garden of raised beds. In this garden, we grow many culinary herbs, including a variety of spearmint that we use to create our signature mojitos and Hector Mint Lemonades. We pick the mint daily, as well as edible flowers and other herbs to cook with and garnish most of our plates. We grow heirloom tomatoes and cherry tomatoes that we use for our smoked tomato Bloody Marys, antipasti plates, and salsas. We grow sorrel, fennel, and leeks, as well as rhubarb, raspberries and gooseberries. We also grow string beans, which we turn into dilly beans, and peppers for our many hot sauces. Dawn Hedden is now caring for the Stonecat gardens and leading our community of gardeners. Dawn is a longtime friend and she has both managed and waited tables at the Stonecat for more than 10 years. She has also touched the front of the house with her green love thumb. We buy all of our animals whole, local, and antibiotic and hormone free. We buy cows, pigs, sheep, ducks, chickens and rabbits. Our whole animals are brokered locally by Finger Lakes Family Farms. They bring them to Leona meat processing plant, a certified organic facility, were they are processed to our specifications. Scott has personally toured the facility many times and finds Leona to be extremely clean and professional. They are a zero waste plant that composts any remains. We get our cows broken down into whole primal cuts. After killing and hanging the cow we take the fresh tenderloin, New York strip and ribeye cuts and run them as our fresh cut steaks. The rest of the animal is meat lockered for us at Finger Lakes Family Farms in Seneca Falls. We call for the remainder of the animal as we need it. We brine and smoke our own roast beef for lunch using the bottom round. We use eye of round and shoulder from cow to age our own bresaola. We marinate skirt, flank, brisket and other beef cuts and slow braise them for our bahn mi sandwiches and, of course, the ground goes toward our world class burgers and gyro meat. When steak cuts are not available, we do order naturally raised, antibiotic and hormone free steak primals from the Midwest. Our pigs mostly come from Oink and Gobble Farms in Interlaken. We make our maple juniper sausage with most of the animal and bacon from the bellies. The lower legs are shanked for ossobuco and braised for specials, with the center cut chops and tenderloin harvested fresh for daily specials. The sheep are from White Clover Farm in Canandaigua. Chickens and ducks are broken down in house and stocks made from the bones for soup and poutine gravy. The meat is used for specials and staple menu items, and livers used for pâtés and terrines. Learn more about some of our primary local purveyors!